Intrusion detection and intrusion prevention systems (IDS/IPS) help to identify potential threats and to launch a swift response to defend your network. 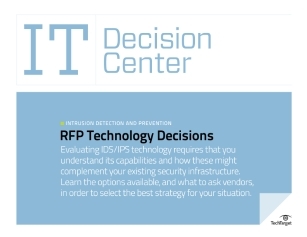 There are many factors to take into account when choosing IDS/IPS products, and this Decision Center series lays them out. It also provides critical questions to ask vendors, offers insight on how to match product features to your particular requirements, and challenges vendors in the IDS/IPS space to present the facts on their offerings.